Oregon has joined the family of Pinotage growers. Melrose Vineyards, located in the delightfully named Umpqua Valley, near the town of Roseburg in southern Oregon, planted Pinotage in 2004 on the banks on the South Umpqua River and currently they have one acre of Pinotage. Melrose released their first varietal Pinotage, from the 2006 vintage, last November and so far it has won a bronze medal at the 2009 San Francisco Chronicle Wine Competition and a silver medal at the 2009 Oregon Seafood & Wine Festival. Oregon joins fellow US states California and Virginia in growing and making commercially available varietal Pinotage along with Montana, New York and North Carolina which are growing Pinotage. A roast rack of Karoo lamb is just the right dish to prepare on Heritage Day. This dish maybe time consuming to prepare but the result is an amazingly delicious dish which is well worth the effort. To keep within the heritage theme, serve this meal with a uniquely South African Pinotage. The Arniston Bay Pinotage 2008 is a well balanced wine with vanilla tones and savoury flavours. This wine is a great match for the South African Karoo lamb. To keep within the heritage theme, serve this meal with a uniquely South African Pinotage. The Kumkani Pinotage 2006. This well balanced wine has a ripe berry fruit nose and French oak aromas adding vanilla and spice with a excellent finish. Both blogs posted Sally Schneider's December 1969 recipe copied from a US site and although temperatures have been converted to Celcius from Fahrenheit the lamb pictured is not Karoo but "American lamb, because it is corn fed, is milder in flavor than Australian or New Zealand lamb, which is grass fed." How come both Kumkani and Arniston Bay blogs happened to post the same thing on the same day? Seems that the brands have outsourced production of their blogs to the same PR Agency, Bivio Consulting. Bivio Consulting also run the blogs of several other wine brands including Boschendal , Four Cousins ,Tall Horse and Versus . Content is mostly cut and paste items from other websites with minimal original content or news about the winery, it staff or its products. No doubt Bivio managed to impress the wineries with the importance to a business of blogging, however Bivio themselves are not leading by example. Bivio's very own blog, hosted by the free Blogger service, has had only 3 items posted this year, the last one on 10 April declared "Our site is currently under construction". I think these wineries are missing the point. Surely a blog is a way to communicate with their customers and to let us who cannot visit the winery to know what is going on throughout the seasons. It isn't rocket science and it needn't cost money. I can imagine the winery MD smugly boasting that 'Oh, yes, we have a blog' but I don't think that paying a PR agency to post content culled from the web that has no connection with the wine brand that owns the blog makes sense. Flat Roof Manor have added a pink wine to their list. It’s called Pinot Rosé and is a 70-30 blend of Pinotage and Pinot Grigio. No reason given for the inclusion of the Grigio but I guess it adds to the flavour profile and the fashionable Grigio name will help sales. Or is it they just didn’t have enough Grigio to make enough pink wine on its own? The wine is made at Uitkyk winery by Estelle Lourens. On the property is an historic manor house which is one of only three 19th century Georgian flat roofed manors still standing in the Cape. The brand’s label shows the flat roof with a cheeky cat that legend says preferred to stay on the roof long after its owners left the estate. 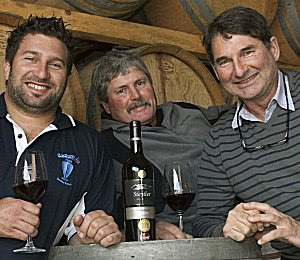 Pinotage loving winemaker Guy Webber has ventured into the world of blogging. On the Couch with Guy Webber started on 20 July and now has three posts. Guy is winemaker for Stellenzicht and Hill and Dale and it is on the latter’s site he is musing – mostly about women it seems. Kanonkop 2005 Pinotage won the only Gold medal awarded to varietal Pinotage in the 2009 Decanter World Wine Awards. Judges described it as “Violets, red fruit, subtle spice, a bit of oyster shell. Fresh and appealing palate, with lovely concentrated strawberry fruit and some pencil shavings, tomato paste and truffle. Balanced elegant tannin”. Beyerskloof Synergy 2005 Cape Blend (with 33% Pinotage) won a Gold medal. (As previously reported, a varietal Pinotage from Kaapzicht won the International Trophy for Red Single Varietal over £10 and Kaapzicht’s Vision Cape Blend won a Gold medal at the same competition. Wine Spectator gave 92 points to J Vineyards 2007 Russian River Valley (California) Pinotage. The successful Golden Kaan brand is now 100% owned by KWV after they bought out founding partners Racke. Café Culture Pinotage 2009 is about to be released. Richard Rowe, chief winemaker at KWV, says "The 2009 Café Culture Pinotage is one of the best Café Culture wines we have produced; in fact the cooler season and absence of any heat wave conditions resulted in ideal growing conditions for the grapes. Consequently the taste experience is richer and softer, and we have been able to release the wine a few months earlier than normal - a bonus for Café Culture fans." Rowe recommends cooling it before serving. “The 2009 has intense, fresh coffee and mocha flavours, which are more pronounced than other years. This is a stylish wine which can be enjoyed for all occasions," says Rowe. "I recommend chilling it slightly in summer as South Africa's room temperature can get fairly high. This will ensure that your Café Culture tastes just as delicious when sipped around the pool." Pinotage is being made in Oregon. Melrose Melrose Vineyards in Roseburg Oregon released their first vintage of 100% Pinotage last year and it a won Silver medal at the Oregon Seafood & Wine Festival 2009. Unfortunately I have not received a reply to my request for information. Kaapzicht Estate’s Steytler Pinotage 2006 has won the International Trophy for Red Single Varietal over £10 at the 2009 Decanter World Wine Awards, it was announced this week. The same wine had earlier won the Trophy for South African Red Single Varietal over £10 Trophy – watch Yngvild Steytlers reaction to that award here – and their Kaapzicht Steytler Vision 2006, a Cape Blend containing 35% Pinotage, won a Gold medal in the same competition. Five years ago, at the 2004 International Wine and Spirits Competition in London, the 2001 vintage Vision won the Trophy for world’s best red blend, the first Cape blend to so recognised. The fruit for the winning Pinotage and Cape Blends came from the same block of old bush vines. Danie Steytler, cellarmaster and co-owner of Kaapzicht Estate said “Bottelary Hills is a prime winegrowing terroir for red wine. The northwestern slopes have the perfect combination of direct sunlight and cool prevailing sea breezes from False Bay and Atlantic Ocean. The hills on our estate are situated only 20 km from the coast of False Bay. The medium potential soils and dry land vineyards produce low yields of 4 to 8 tons per hectare, thus creating small berries with concentrated flavours. Decanter World Wine Awards claim to be the world's biggest wine competition; this year there were 10,285 entries. Congratulations to the Steytlers and the Kaapzicht team.